North of Narrabri: Why the change to Aussie modeling? Why the change to Aussie modeling? Changing of the Guard: NSWGR 47 and 44 Class locomotives cozy up to a Walla Walla Valley HH660 shortly before demolition of the WWV layout began. . .
By the end of January this year, I'd decided to make the switch to modeling Australian prototype. The idea to try something "new" in my modeling pursuits had been percolating for a while. I had been true to modeling the WWV since 2002 or so, when my small bedroom-sized freelance Pacific Northwest shortline layout morphed into a representation of the WWV--the concept was so close to begin with anyway that it was no big decision to do so. These were the first layouts I'd built in "adulthood." 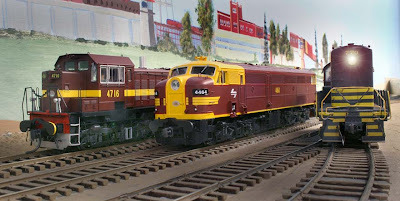 I'd dabbled with modeling over the past 20 years, always in HO scale, and building everything from Western Maryland F-units to Delaware & Hudson U30C's to Burlington Northern C636's and Milwaukee Road GP9s. But it was the WWV that my modeling was most associated with (the layout was even featured in Kalmbach's Great Model Railroads a few years ago). The last version of the WWV had grown from a 10 X 11' bedroom in our previous home to a 19 X 17' bonus room in our current residence. The layout design was a faithful adaptation of the WWV's track arrangements in its two major towns, and included an active interchange with Northern Pacific as well as a parallel Union Pacific branchline that allowed three two-person switch crews to keep busy for a couple of hours on operating nights. It was an even better layout that the last one, and certainly very keen on intense operations (sometimes the switching gymnastics would completely stymie guest operators). Which all begs the question "why switch? why completely abandon a layout, a knowledge base seven years in the making, over 100 very detailed and specific freight cars, and a carefully designed operating plan to model something you know nothing about--rural railroading in New South Wales, Australia?" And a good question it is. All I can call it is a "seven-year itch." I felt I'd largely gotten to the end of the road in researching the WWV itself. I had a lot of work ahead on the railroad, scratchbuilding many structures, scenery, etc., as well as the construction of a small peninsula allowing some rural running between my layout's two major towns. So it wasn't like the layout was done. Our two sons are growing up quicker than I'd expected, too--and though our house is plenty big, I began to realize that the bonus room was too big a space to be fully devoted soley to my hobby pursuits. If only the layout would only hug the walls, allowing for the middle of the room to be free for use by the rest of the family. . .
About this time, co-worker Lance Lassen returned from a vacation to Australia last fall, bringing with him great photographs, experiences, and several HO-scale models of Australian prototypes. . . including a beautifully modeled Goodwin-Alco 44 Class for me! I'm a sucker for Alcos, and the fact that these are still operating down under today really piqued my interest. I read a few copies of the Australian foamer mag "Motive Power" as well as several books Lance had returned with, and I began to see how modeling a prototype on Australia would be just so. . .wild. . .that it might well be an enjoyable modeling challenge. One of the books Lance returned with, Ron Preston's "48 Class: Backbone of the Railway"--about the branchline diesel workhorse on the New South Wales system--narrowed my interest to the Northwestern NSW branchlines in the Narrabri area. Thanks to the magic of the internet, I was able to find trackage maps of the area, photographs of the rail facilities, and get in touch with a retired railroader and modeler who worked into Narrabri in the late 1970s and early 1980s--my period of interest. Colin Hussey provided me an amazing amount of information about how the railroad operated--from the traffic hauled to the types of cars used, to how the staff system of train control works, and even throwing in a bit of history on how the state railway suffered as a political football. Colin was kind enough to scan several pages of freight and passenger schedules of the period as well. Other Australians on internet discussion boards have been just as friendly and helpful, providing photographs and videos of the Narrabri area, and answering scores of questions in addition to just being cheerleaders for the project. Lance has caught the Aussie bug as well; he didn't rip his whole railroad down and start over, but he converted his existing railroad to more closely resemble operations out of Werris Creek, NSW circa 2005, concentrating on the climb over the Liverpool range and the 'banker" locomotives shoving grain and coal trains over the 2.5% grade. The all-important "Givens and Druthers"
This is the start. . . .